Browse among shining silver objects for a set table – a theme where we present a curated selection of cutlery, bowls, carafes, candleholder, plates and cream jugs which all enhances and personalize the experience at the dinner table. Objects in silver are often a result of inherited knowledge and craftsmanship skills by silver smiths, and the result of the craftsmanship often becomes heritage within families and relatives in many Swedish homes. Tasteful and classic silver lasts over time, generation over generation, and the objects in this theme auction are no exception. Discover silver by Johan Gottfried Hildebrandt, Per Zethelius, Jacob Ängman, Erik Frisk, Carl Gustaf Högstedt and many more. Showing all 40 items matching your search criteria. A silver plate by Atelier Borgila, Stockholm, 1941. 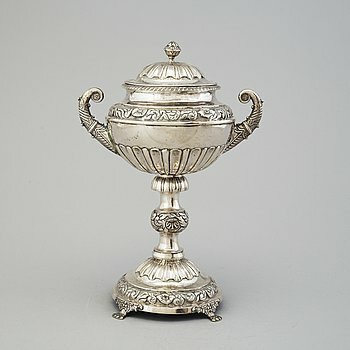 A silver bowl, Lars Larson & Co, Stockholm 1872. MAGNUS FRYBERG, a silver sugar bowl from Jönköping, 1839. A pair of silver bonbonieres, Lars Larsson, Gothenburg, 1853. A silver jug by John Langlands, Newcastle, England, 1769. 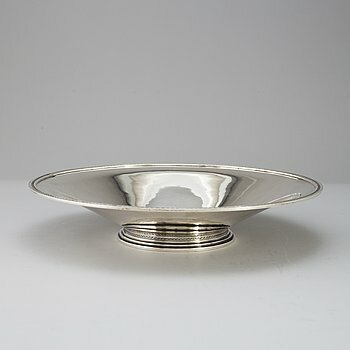 A SILVER SWEET MEAT BOWL, Carl Gustaf Högstedt, Kalmar, 1841. 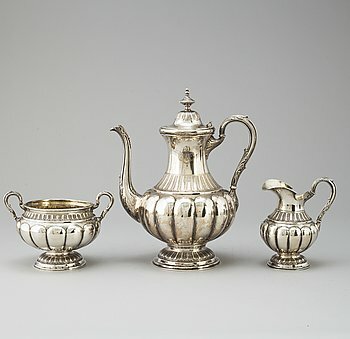 A three-piece silver coffee service, marked WP, Turkku, Finland, dated 1894 and 1897. 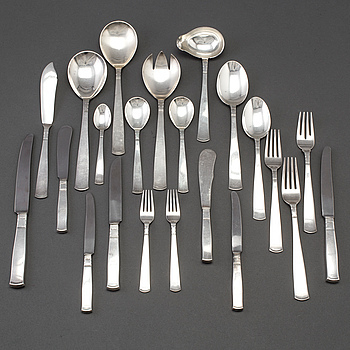 A SET OF 160 PIECES SILVER CUTLERY, "Rosenholm", GAB, 1950s. 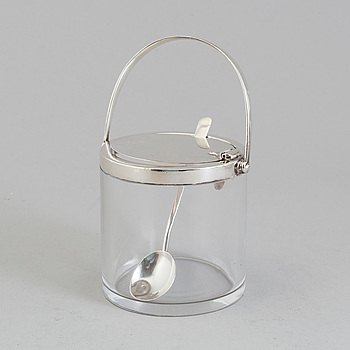 A glass and silver marmelade jar and spoon by Hukin & Heath Birmingham, England, 1934. A Swedish late 18th century cruet-set, mark of Pehr Zethelius, Stockholm 1799. 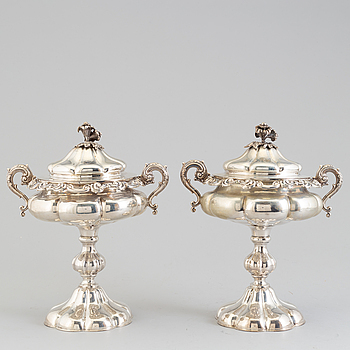 HORACE WOODWARD & CO LTD, a pair of silver salt cellars from Birmingham, England, 1905. Three Swedish silver spoons, 1790 and 1792. A RUSSIAN SILVER CREAM JUG, maker's mark Erik Frisk, St petersburg, 1825. RICHARD FOX, a pair of three armed, four light sterling candelabra, London, 2001 and 2013. 48 pieces of cutlery 'Rosenholm' by GAB Stockholm and Eskilstuna. A silver and coconut rococo soup spoon, Sweden 18th century, marked LS. A silver soup ladle by Evald Nielsen Copenhagen 1916. K ANDERSON, an Empire style silver tray from Stockholm, 1895. A Swedish 18th century parcel-gilt cream-jug, mark of Sven Nyberg Varberg 1785. A Swedish late Gustavian silver sugar bow, maker's mark Bengt Fredrik Tellander, Jönköping, 1827. STEPHAN WESTERSTRÅHLE, a parcel-gilt beaker, Stockholm 1792. A SILVER SUGAR BOWL AND COVER, first half of the 20th century. LARS LARSON & CO, 12 parcel-gilt silver and glass salt cellars with spoons, Stockholm, 1876. 20 pieces silver cutlery 'Rosenholm' by GAB Stockholm and Eskilstuna. Two silver tumblers, without hallmarks, Sweden, 18th/19th century. A German 18th century silver Rococo sugar-casket, mark of Johann Gottfried Hildebrandt, Berlin ca 1740-60 (1743-1778). A Swedish early 20th century silver sugar-casket, mark of CG Hallberg, Stockholm 1908. A Sigurd Persson silver soup ladle, Stockholm, 1970. 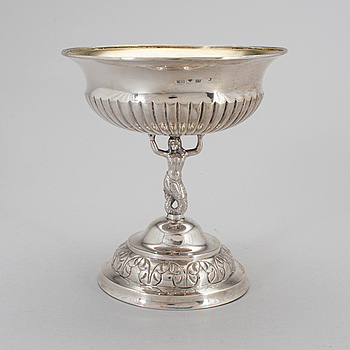 AN ENGLISH SILVER SWEETMEAT BOWL AND COVER, George Nathan & Ridley Hayes, Chester, 1908. A matched pair of Swedish silver sugar-bowls, mark of JE Torsk and GAB, Stockholm, 1906. A PAIR OF SWEDISH SILVER SUGAR BOWLS by Gustaf Möllenborg, Stockholm 1877. GUSTAF MÖLLENBORG, a silver soup ladle, Stockholm 1847. A silver saucepan by JF Björnstedt Stockholm 1824. A SET OF 72 PS SILVER CUTLERY, Cohr, Denmark, mid 20th century. CG HALLBERG, a pair of silver dishes from Stockholm, 1939-56. A matched pair of English silver dishes and covers, marked London 1910 and 1912. An English 18th century silver tea-pot, mark of Charles Aldridge and Henry Green, London 1786. 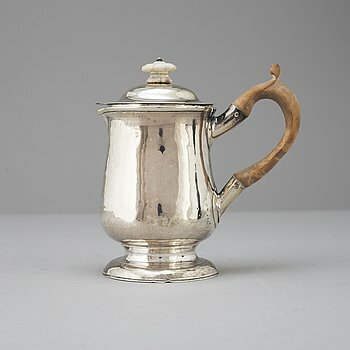 An English 18 th century silver coffee-pot, mark of Benjamin Gignac, London 1763. 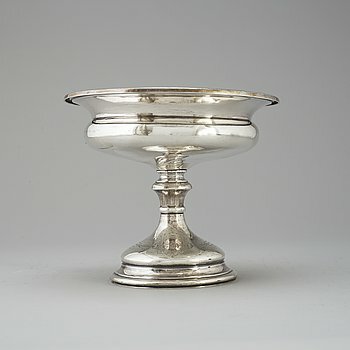 An English 18th century silver plate/dish, mark of Edward Wakelin, London 1754.